Too often we are accustomed to think that social conflicts at the end of the Great War have only affected Central and Eastern Europe, and not the western democracies. What happened in Glasgow in Scotland from 29 January 1919 proves the opposite. More than 40 thousand workers, then climbed to 60 thousand, went down in the square requesting the reduction of the working week from the well 57 hours of then to 40, without reduction of the salary: a request that today seems to us completely reasonable, and that at the time was motivated also From the pressing need to give space to the huge number of soldiers of which demobilisation was underway. The strike had spread throughout the region, also seeing the participation of over 30 thousand miners in Lanarkshire and Stirlingshire. It is interesting to read how the protest was approached at the highest political level, that of the War Cabinet, which still represented the summit of the Nation: its components, including many names destined to become famous, looked with particular Concern in the Glasgow protest, as a symptom of a bolshevization of the worker masses, to the point of preparing the intervention of the army, which in theory was only permitted if martial law had been proclaimed. The War Cabinet reunited with the three post-Meridianas of January 30, 1919, following a telegram sent by the Lord Prevost of Glasgow (a sort of prefect), who informed of the ongoing negotiations with the eleven representatives of the strike workers, asking Instructions. The government responded that it was foreign to the negotiations between workers and employers, as it “would destroy collaboration between employers and workers, on which industrial peace is based”. In the discussion, it was also noted that an agreement seems to have been reached, in the naval and construction sectors, for a reduction to 47 hours. Interesting is the line suggested by Winston Churchill, as stated in the Minutes of the sitting: “In Liverpool there have already been clashes with victims and this situation has been going on for six weeks, after which we have reached an agreement. The current situation in Glasgow was going to be mounting for a long time. But hostile people are a minority, so in your opinion you have to come to a confrontation, to heal the climate. We should be careful to have a serious provocation before adopting strong measures. Acting initially soft we will obtain the support we need from the nation, and at which point the Army can be used more effectively. The time to employ it has not yet arrived. Meanwhile, the Defence of the Realm Act is still in force and the leaders of the uprising can be arrested “(Minutes of a Meeting of the War Cabinet held, at 10, Downing Street, S.W., on Thursday , January 30, 1919, at 3 P.M., 522, P. 4)). Other members of the Cabinet of war immediately agreed with Churchill, and therefore measures were made which envisaged the use of forces not only of police but also of the army. The next day, Friday, January 31, while the delegation of the Strikers met with the Lord Prevost, a charge, apparently unmotivated, of the police with blows of stick led to the stars the climate of tension, and the strikers were able to reject the Police. The union leaders rushed out of the palace of Lord Prevost to try to restore calm, but also one of them was severely beaten. At this point, the incidents were aggravated, widening in the centre and on the outskirts of the city, causing many wounded: it was then talked about the Bloody Friday of Glasgow. 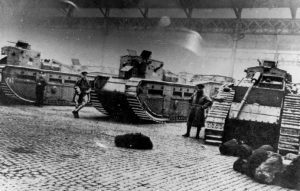 In the end, just as Churchill wished, 10 thousand soldiers were employed (taking care that they were not Scottish), machine guns at the corners of the central George Square, main theatre of the clashes: even 6 medium tanks Mark C (originally Destined to attack the Germans on the Western Front: in the photo they are “parked” in the area of the saltmarket of Glasgow) would arrive on February 3. Even if the troops were not directly employed, their presence helped to restore the order, which happened within a few days. On February 10, in fact, the strike ended, and the workers obtained the 47 hours that had been discussed in the session of the War Cabinet. The leaders of the revolt were tried and some of them condemned to relatively mild sentences.